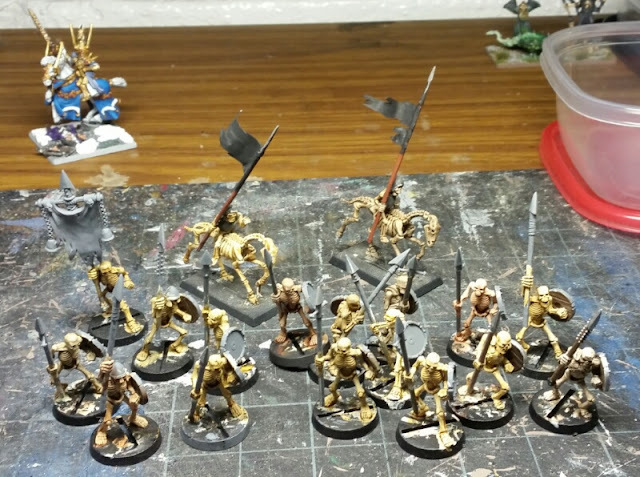 Skeletons to round off another horde, and a couple of mounted standard bearers. On the other end of things, I've been putting more thought into the Jackrabbit Trading Company, and have developed the idea behind the Boar Cleavers further, to the point that there is now a second "named" regiment in the company, the Deep Root Guard, aka "the Deep Roots." I've sketched out an outline, and will write out more later. The latter unit will be getting painted in early 2018.